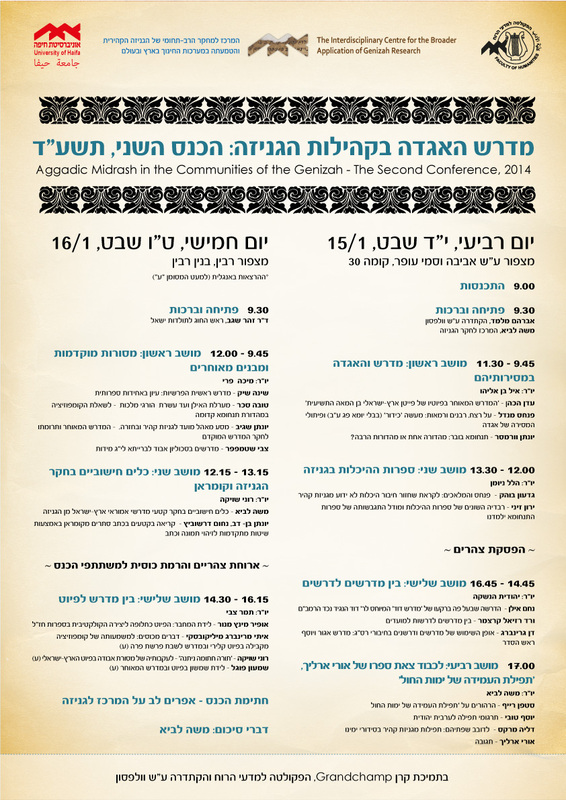 The newly founded center for Genizah Research at the University of Haifa will hold the second conference of the research group on “Aggadic Midrash in the Communities of the Genizah” on Wednesday and Thursday next week, 15-16/1/2014 . The conference will present the fruits of the group, as well as lectures by scholars who deal with the subject and adjacent topics such as the relationship between Piyyut and Midrash, the question of oral homilies and sermons, the representation of Midrash in Judeo Arabic materials, and more. The first day will also include an event marking the recent publication of Uri Ehrlich’s edition of the Amidah prayer according to Genizah fragments . On the second day there will be a special session on the use of new computational tools for classifying and analysing material from the Genizah from Qumran.